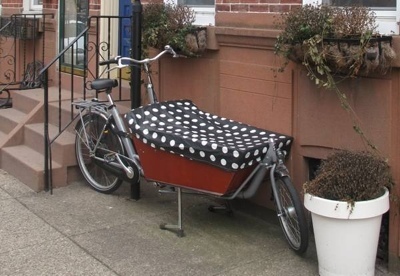 A Kidical Masser's gray Workcycles bakfiets was stolen two nights ago in the Fishtown section of Philadelphia. If you see this bike please contact through Craigslist or call the police. There is another similar black one also in Fishtown. To get the bike they cut straight through her home's railing. Now I am going to research installing ground bolts to chain our bikes to after reading that.